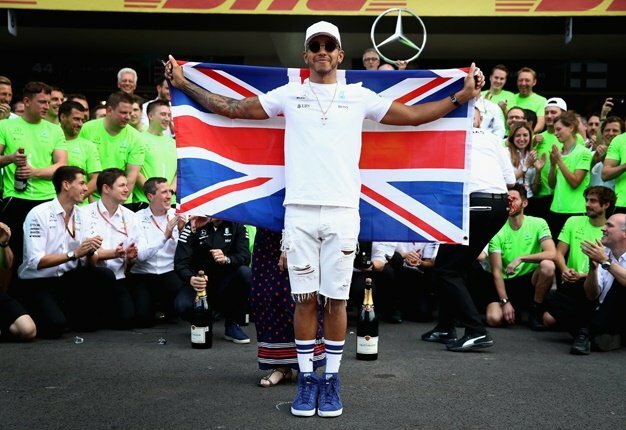 Sao Paulo - Record-breaking Lewis Hamilton claimed his 10th pole of the season and Mercedes' 100th in Formula One on Saturday when he dominated a rain-threatened qualifying session for Sunday's Brazilian Grand Prix. The new five-time world champion clocked a track record best lap in one minute and 7.281 seconds on his second run in the final session to boost his hopes of a rare Interlagos victory and Mercedes bid for a fifth straight teams' title. The leading four drivers were scrapping for any advantage for their teams as Ferrari bid to out-score Mercedes by 13 points to keep alive their bid to stop them retaining the constructors' championship. "I think it's better if I don't say anything," said Vettel afterwards. "They shouldn't call us like that. When the conditions are like that, it's not fair. I wanted them to hurry up." "That was a tough session," he said. "The weather was going up and down.Ferrari are very quick this weekend, but we did a lot of work to make sure we are ready. "It's great to be here in Brazil - I have Ayrton Senna's design on my helmet." I'm a 50 year old man looking to meet women between the ages of 35 and 63.